We are Professional Auctioneers offering all types of assets at Liquidation Auctions. Sellers benefit from quick results and Buyers gain access to merchandise. Both gain from Competitive Bidding. Where did you see us? Classic Cars to Benefit Auctions. Assiter & Associates Auctioneers have provided Auction Services for thousands of consignors with all types of merchandise and property. Specializing in Live Auctions with online bidding our company uses the latest in technology to bring bidding off location even to any device. Live on-site Auctions are the traditional mental image when thinking of the Auction Method of Marketing. Our Professionals have over 30 years experience. Today’s Strategy is to combine the excitement of the Chanting Auctioneer with world-wide promotion and bidding technology for any device. 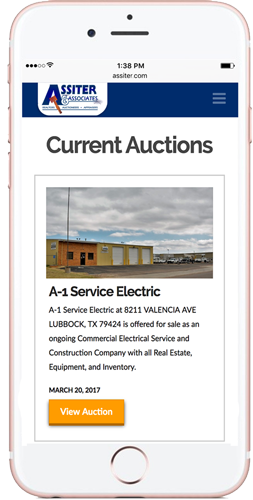 Our Auctionflex Software provides Online functionality directly from our on-site computers to Bidders, even Cell Phone Bidders anywhere in the World. Digital Auction Strategy allows Assiter & Associates Auctioneers to promote and offer your assets to more qualified buyers via the most economical means and allows buyers to participate easily. 640 Acres CRP NE Floyd County SOLD! !